As soon as school resumes after the new year, teachers everywhere will be asking their students to write New Year's Resolutions!! I know this is something that I ask my students to do each and every year. For us, the new year is the start of our second semester. It is the perfect time to encourage students to set goals for the remainder of the school year!! 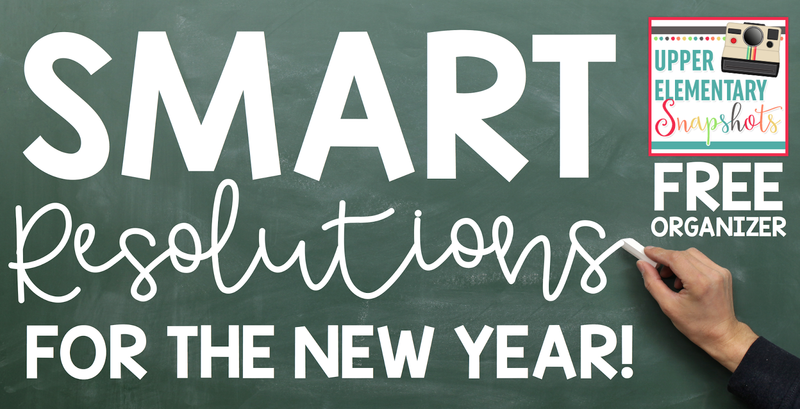 This year when you are asking your students to write goals and resolutions, make sure that they are writing SMART resolutions. You can have students use this FREE organizer to make sure that their resolutions are Specific, Measurable, Attainable, Relevant, and Timely. When given the task to write resolutions for the New Year, students tend to stick with the same generic goals: Get better grades, work harder in school, improve my behavior, and so on! 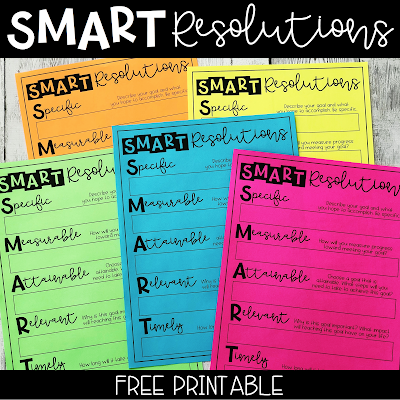 Using the SMART format encourages students to come up with resolutions that they can use to hold themselves accountable. Students should be sure to come up with goals or resolutions that are specific. Ask them to be specific about what they hope to accomplish, and what their goal will look like once it's achieved. Have students really reflect on what's challenging for them and where they hope to see themselves at the end of the school year. When writing their goals or resolutions, students should keep in mind how they will measure their progress. For instance, if students want to improve their grades, they will want to be specific about what grade they are shooting for. If a student is working below grade level in math, he or she may set a goal to have at least a B- in math by the end of the school year. Then this student could use progress on math assignments, quizzes, tests, and assessments to track his or her progress. As they are building their resolutions and making sure they are specific and measurable, students should remember that their goals need to be realistic and attainable. On one hand, we want to challenge students and help them to make progress. But on the other hand, we need to make sure they aren't setting themselves up for failure. Students should choose goals that are not too easy to achieve, but also not too difficult to achieve. Encourage your students to choose goals that are relevant to their own strengths and weaknesses. They should also avoid choosing a goal just because it's what a friend is choosing. They need to be sure to connect their goals to their own educational needs. Students should decide how long it will take them to achieve their goals. They should also have an end time in mind: By the end of the year, by the end of the quarter, by the start of the next school year, etc. They might also want to build in some benchmarks. At my school, students use Accelerated Reader and earn points by taking tests on the books they read. All students have their own point goals, and I often encourage them to break it up into smaller chunks to make it more manageable and to help hold themselves accountable for meeting their final goal in a timely manner. All of these steps work together to help students craft resolutions that will encourage their growth in the areas of their choice. 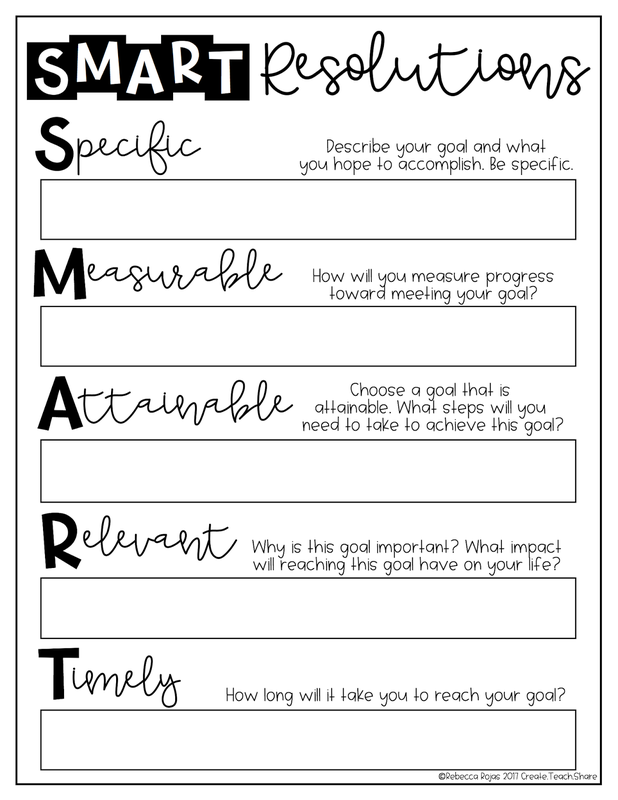 SMART goals give students a chance to set themselves up for success, and the New Year is the perfect time to get students back on track for the second half of the school year!! 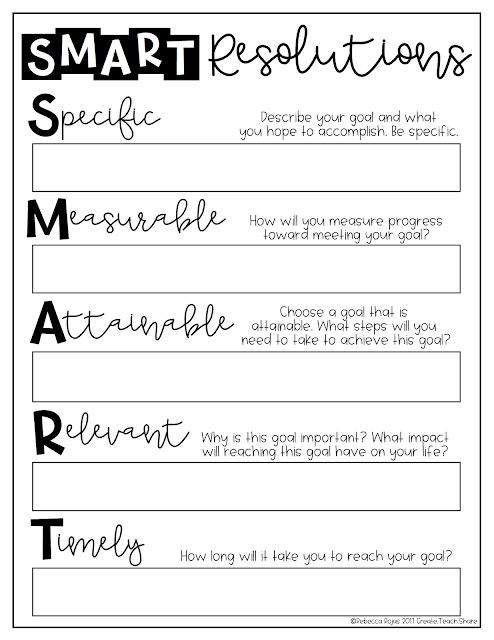 If you are having students write resolutions this year, please feel free to download this FREE organizer to help them organize their goals!! 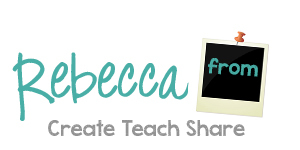 Click on the picture below to visit my shop and download this FREEBIE!! Once students use the organizer to write their SMART resolutions, they should publish them to make them official!! 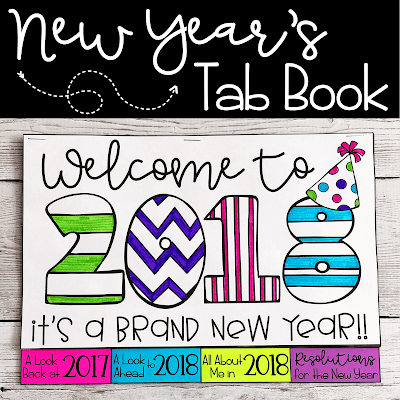 This New Year's Tab Book is the perfect place for students to reflect on the previous year, look forward to the next, and record their RESOLUTIONS!! Click on the pic to learn more! !